Why our reaction to the oil spill absolutely terrifies me. Take your pick on what's most infuriating about the oil crisis in the Gulf. There's the growing evidence that the platform blowout that caused all that crude to erupt out of the ocean floor was entirely preventable and should never have happened in the first place. BP cut corners on safety to save money, and regulators barely seemed to care. And now no one has any real clue how to contain the spill—we just have to watch helplessly as the ever-expanding oil slick poisons fisheries and kills off marshlands and coral reefs. What's especially unnerving, though, is that the recklessness that helped bring about the spill, and the political reaction that followed, seem to indicate a larger inability to prevent and cope with other large-scale ecological catastrophes—particularly climate change. True, the analogy's not perfect: The Deepwater Horizon blowout was a sudden and local event, while global warming is slowly creeping up on us and, well, global. But the same set of human characteristics that precipitated the one calamity may well hinder us from stopping the other. 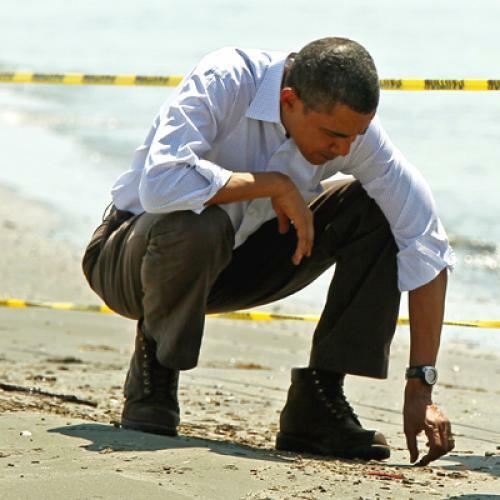 For one, the Gulf spill highlights our general ineptitude at properly assessing risk. As we now know, neither BP nor the government took adequate steps to make sure that a blowout didn't end up fouling huge swaths of the ocean. Partly that's because the agency responsible for oversight, the Minerals Management Service, has become a corrupt mess over the years, too cozy with the companies it's supposed to supervise. But a deeper problem is that, as Cass Sunstein argues in his book Worst-Case Scenarios, humans seem to have an inherently difficult time preparing for low-probability catastrophes—we tend to vacillate between total panic and utter neglect, with little middle ground. One senior administration official recently told McClatchy that "the last time you saw a spill of this magnitude in the Gulf, it was off the coast of Mexico in 1979. When something doesn't happen since 1979, you begin to take your eye off that thing." A disaster doesn't even have to be completely unprecedented to get ignored—it's enough merely to seem unlikely. As a result, it's hard to convince people to pay the upfront costs of averting potential catastrophes, especially when the catastrophes seem remote and uncertain. Back in 2003, the Interior Department agreed with BP and other oil companies that installing a $500,000 acoustic shutoff switch on every offshore rig would be unreasonably expensive (even though such a switch would likely have prevented all that oil from spewing out). Of course, now that BP is staring at billions of dollars in clean-up costs and the prospect of bankruptcy, that $500,000 switch looks like a bargain, but back then, the incentives for short-term cost-cutting were persuasive. Climate change poses a similar dilemma. We know it's coming, but there's still a fair bit of uncertainty as to how bad it could really get. And, as Harvard economist Marty Weitzman has argued, policymakers tend to pay too little attention to the low-probability extreme outcomes that global warming could bring about. Case in point: A recent paper in the Proceedings of the National Academy of Sciences concluded that there's a roughly 5 percent chance that rising temperatures could render vast regions of the planet—like the eastern United States or most of India—simply uninhabitable. Even if the odds of that are relatively low, that's a gruesome enough prospect that it's worth planning for. And yet most of the policy discussions of climate change tend to involve dry discussions of the median expected costs of global warming compared with the costs of reducing carbon. And, again, few people want to pay upfront costs to prevent problems that are decades away: Politicians keep fretting that families could face small increases on their electricity bills if the United States set up a cap-and-trade system, even though the cost of truly dire warming—say, 5°F or more—would make that electricity price hike look laughably minor. Meanwhile, with both the oil spill and climate change, there seems to be a lingering sense that technology can come along and save us if things ever get too ominous. Some conservatives point to geoengineering as the great hope for climate—surely if temperatures ever climb too high, our brightest engineers will figure something out. Maybe we can shoot sulfate particles in the air to blot out the sun, or seed plankton in the ocean to mop up any excess carbon-dioxide. And yet, as we've seen with the flailing cleanup efforts in the Gulf, there's not always a technological solution. Nature, once despoiled, can't always be fixed. Sometimes disaster strikes and there's simply nothing we (or even James Cameron) can do. What's more, when dealing with complex ecological systems, quick fixes can often make the situation worse. The chemical dispersants that BP is using to break up the surface oil could end up wreaking havoc on the food chain on the seafloor—no one really knows. Likewise, we have little idea about whether those wacky geoengineering schemes could end up, say, disrupting rainfall patterns around the globe. What the oil spill also shows is that there's no longer any guarantee that people—and particularly politicians—will change their minds as a result of an environmental disaster. This hasn't always been the case. In 1969, a platform blowout off the coast of Santa Barbara helped kick-start the modern green movement and spurred Congress to pass a series of landmark environmental laws. Yet the reaction to the Gulf oil spill has been far more stubborn. Many conservatives have simply assimilated the BP fiasco into their worldview: Rush Limbaugh and Sarah Palin have (nonsensically) blamed environmentalists for the spill. George Will has scoffed that oil slicks don't kill nearly as many birds as wind turbines do. Even South Carolina's Lindsey Graham, who was once one of the few Republicans concerned about global warming, has decided to abandon the very climate bill he helped draft because it wouldn't—wait for it—do enough to expand offshore drilling. Few skeptics seem to be willing to consider that the biggest ecological disaster in U.S. history should maybe cause us to rethink our relationship to fossil fuels. On global warming, there seems to be an unshakeable faith among many conservatives that things could never possibly get so bad, that the worriers are just being hysterical, that if worst comes to worst, human ingenuity and technological progress will get us out of any jam. And yet the Gulf spill really does suggest that that attitude can be badly misguided, especially when we're dealing with natural forces we don't fully understand.